Sometimes, ceiling fans just don't cut it. They spin meekly, barely generating any air flow to cool down your sweltering room. Or, when turned up high, they can wobble wildly, shaking and vibrating as if the ceiling is about to come crashing down. If this sounds like your ceiling fan, chances are the solution is a simple as flipping a switch. Increasing a fan's efficiency is all about the blades and the direction of their spin. 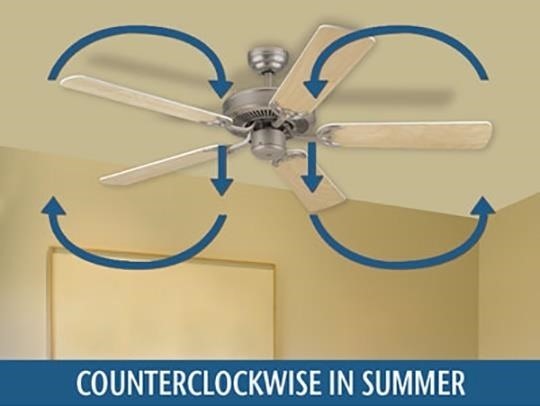 When summer temperatures skyrocket and you're in need of quick cooling, set your ceiling fan to rotate counterclockwise. This motion produces a wind chill effect. Although the blades of many common ceiling fans are flat, their pitch is slightly angled so they push air downwards when spinning counterclockwise. This straight, smooth shape allows the blades to move easily through the air, and the pitch sends a cooling breeze directly beneath the fan. You'll immediately feel a change in temperature, even though the thermometer hasn't budged. You'll also notice you don't have to put the fan on high every time, which could make wobbling worse, since you're going in the right direction now. Ceiling fans aren't only for the sweatiest times of year—they can also help you stay cozy during the winter months. Set the fan blades to spin clockwise, and you'll feel heat drop from above. The clockwise spin creates a small updraft in the room, pulling cool air trapped near the floor upwards towards the ceiling. Those fan blades that blew air downwards in the summer will now mix up the heat hanging out above you and spread it evenly throughout the room. Make sure to keep the speed set to low; otherwise, the hot air will cool down as it travels towards you. Unsure how to change your fan's direction? 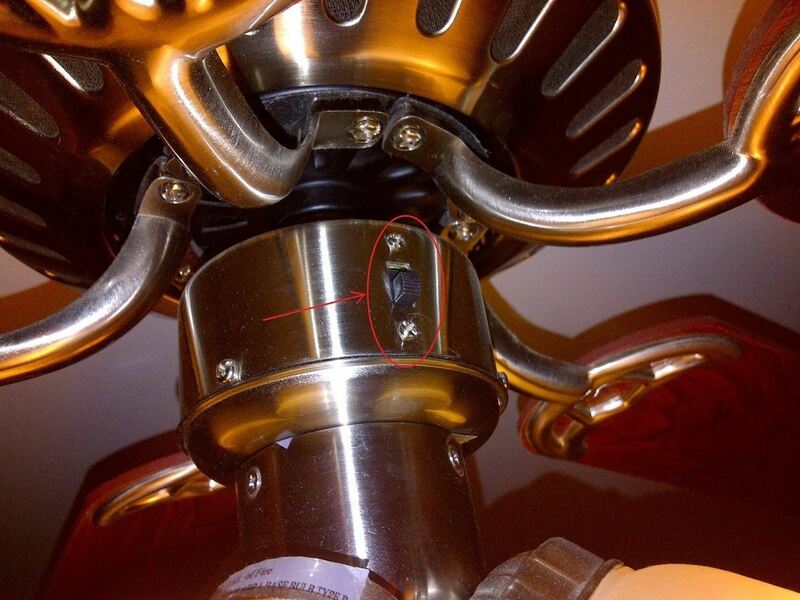 If your fan relies on pull chains, look for a small switch on the fan's body. It should look similar to the one pictured below. To reverse your fan's direction, simply slide this switch into the opposite position. 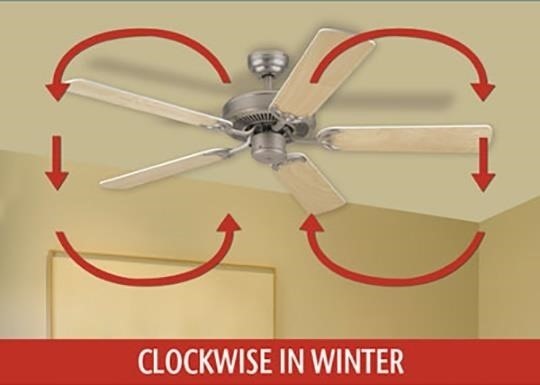 Once it's moved, your fan will react by slowing down and changing its rotation. For fans that rely on remote controls, changing the blade rotation is even easier. 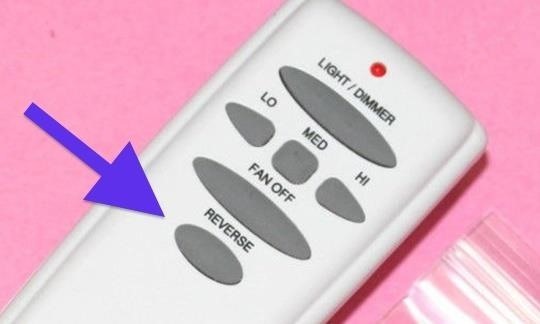 Look for any direction-based buttons on the remote; they often are marked by the word "REV". Just press the appropriate button to switch things up. If your ceiling fan doesn't feature either of these options, check your fan's manual for directions on how to change the motor, if it's possible. Now that you've mastered your ceiling fan, enjoy the breeze—hot or cold!